Give pots and containers a twist this year with this collection of three compact growing Clematis! A revolutionary new breeding breakthrough from world -leading clematis breeder Raymond Evison, this new series of ultra-compact clematis only grow to 60-80cm tall, but as a result make outstanding small yet floriferous choices for pots, containers and even hanging baskets! ‘Bijou’ is a stunning variety that has the most eye-catching electric-purple flowers that will smother pots, planters, baskets or borders with their large star-shaped flowers with beautiful ruffled edges. Usually you’d expect Clematis to grow upwards, but this beautiful new patio perfect series will spill over the edges of large planters on the patio or hanging baskets and create a waterfall of colour. What’s more, with their long, repeat flowering season, you can have colour from May until the end of summer but they’ll stay at a very manageable size. Usually you’d expect Clematis to grow upwards, but this beautiful new patio perfect series will spill over the edges of large planters on the patio or hanging baskets and create a waterfall of colour rather than the typical tower of flowers. What’s more, with their long, repeat flowering season, you can have colour from May until the end of summer but they’ll stay at a very manageable size. This also means they’re ideal for even the smaller gardens, patios and terraces and even balconies – of why not hang up either side of a doorway for a welcoming entrance? 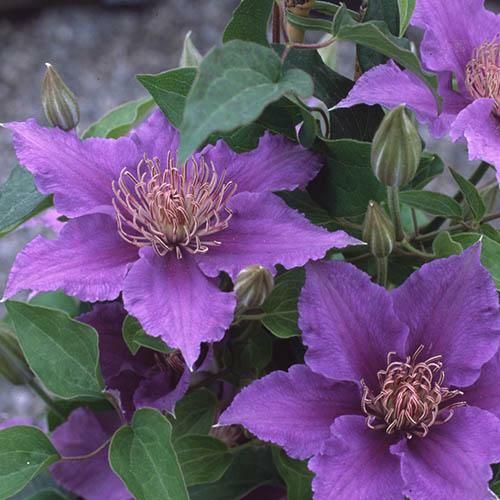 Supplied as a set of 3 x 9cm pot grown Clematis ready to plant out or re-pot.